MakeMyTrip is a pioneer in India's online travel industry, MakeMyTrip came to life in order to aid the Indian traveller with travel choices, instant bookings, and 24x7 customer support. Make International and Domestic flights & hotels booking with MakeMyTrip and get cashback with Zingoy. MakeMyTrip does not help with missing cashback issues. Cashback is payable only on transactions are done through Make My Trip desktop site. Cashback is NOT payable for transactions done from Make My Trip App and Mobile Site. The Cashback will get tracked at the higher amount, the correct cashback will be updated at the time of validation i.e 60 days. MakeMyTrip Domestic Flights Cashback: Now book Domestic Flights from 999 + Extra Offers on your bookings using Bank cards & Wallet Payments. Over the past few years, there has been a marked increase in the number of domestic travellers preferring flights over other modes of travel. And why not? With so many new airlines introducing domestic flights to even smaller cities within India at competitive airfare, there couldn't be a better time to plan your domestic travels. Makemytrip Domestic Flight Coupon : Up to Rs.1,000 instant discount on Domestic Flights Booking. Minimum booking amount should be Rs.4000 and above. Coupon is applicable for HDFC Bank Credit Cards and EMI only. The offer is valid for 1 booking per card per month. Makemytrip Flight Coupon : Flat 15% up to Rs.1,000 on Domestic Flights. No minimum booking amount is Required. Coupon is applicable for Lakshmi Vilas Bank Debit Cards and Net banking. The offer is valid for 1 booking per card during the entire offer period. Save upto 24.0% with these Makemytrip Gift Cards on your shopping. Makemytrip Domestic Flight Coupon : Get Flat Rs.1500 Instant Discount on domestic Flight Booking. Now Book domestic flight booking amount should be Rs.10,000 and above. Offer is applicable for HSBC Credit Card Users only. Valid on Website, mobile site and mobile app (Android & iOS) only. Makemytrip Bajaj Finserv Offer : Get upto Rs.1500 off + No cost Emi on Domestic Flight booking. Minimum booking Value should be Rs.6000 and above. Applicable for Bajaj Finserv Emi Card only. Coupon is Applicable on MakeMyTrip Website, Mobile site, Android & iOS App only. To avail the offer, customer must enter E-Coupon MMTPAY in the E-Coupon field. This offer is valid from 1st Feb'19 to 30th Apr’19. Offer is valid on 1 booking per PayPal Account during the entire offer period. Flight offer is valid on 1 booking per MMT Account during the entire offer period. Cashback will be credited in PayPal’s account instantly. Offer valid on First PayPal Transaction only. How to Save & Get Cashback on MakeMyTrip Booking through Zingoy? MakeMyTrip has been catering to the diverse needs of travelers all across the country by helping them book flights and hotels online. Even if you are planning a trip abroad, MakeMyTrip will lessen your hassle by letting you book the best international flights and hotels online at the best rates possible and also you can earn extra cashback through Zingoy. To enjoy a more hassle-free booking experience you should download the app on your mobile. The flight fares, as well as hotel rates, are spiraling up, the coupons which you can avail on MakeMyTrip offers a big financial relief to you. There are hefty discounts to take advantage of, on certain trips you can even expect to get up to 62% discount. While booking your tickets on MakeMyTrip, you can easily find the hot offers and coupons on the site. With the help of MakeMyTrip promo codes, you can save your pocket on every booking. But if you are looking for bigger financial benefits out of your offers, then you need to be on Zingoy. If you have already been on Zingoy, then you know that it is the top cashback offers site in India, which helps users derive more financial benefits with great MakeMyTrip cashback offers than other travelers. 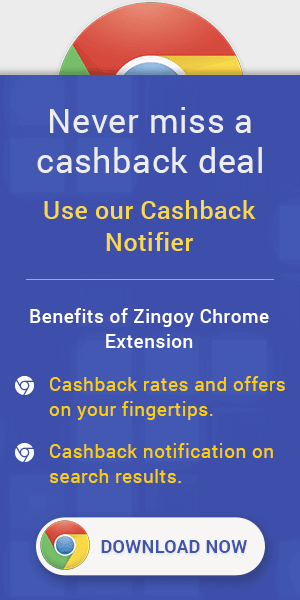 People prefer Zingoy over other cashback sites because they can easily access all hot coupons and promo codes on Zingoy on one page. But what makes Zingoy special is the fact that they can always get cashback over and above offers on MakeMyTrip on this site. To get maximum benefit out of MakeMyTrip coupons on Zingoy, you should open an account on Zingoy, or you could access the valid MakeMyTrip promo codes on Zingoy app. It is absolutely free and you can access over 200 stores and brands. Choose the offers you like and click ‘Shop & Earn’ to visit MakeMyTrip and complete the booking. Do not visit any other site or close the tab in between. If you don’t find a particular offer on this page, use the ‘Joy of Sharing’ pane on top of this page to create your own shopping link of MMT. Always use a link given or created on Zingoy to shop to always earn cashback on MakeMyTrip. The cashback you earn will be credited to your Zingoy within 3 days and validated after 30 to 60 days. Make the most out of MakeMyTrip offers with Zingoy. Spend holidays with your family and friends by booking flight & hotel tickets through MakeMyTrip. You can book online tickets conveniently from home or office. Special discount offers runs on every holiday season like Republic Day, Independence Day, Diwali, Christmas and New Year were MakeMyTrip bring you some attractive discount on flight booking. If you are looking latest deals with MakeMyTrip cashback opportunity you can simple bookmark this page. Save another 24.0% by using Gift Cards on your shopping at Makemytrip.